It’s hard to escape it this time of year: with cold and flu bugs lurking at every turn, and frigid temperatures making even the healthiest of noses start running, winter is Kleenex season. A box of tissues in every room of the pad becomes a practical necessity. Sadly, though some manufacturers are starting to catch on to the fact that ugly Kountry Kraft prints aren’t to everyone’s aesthetic tastes, the good tissue sales always seem to be on the boxes that clash horribly with your color scheme. 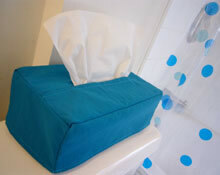 No need to live with that eyesore of a brown-and-peach kitty motif tissue box … with just an hour or so of free time and a few inexpensive materials, you can easily whip up a tissue box cover that goes perfectly with your décor. 1 Get the length, width and height measurements for the tissue box you’re covering; measure the length T of the tissue slot as well. Jot these numbers down.